British poster - INF3-160 Fighting Fit in the Factory. Artist: A. R. Thomson. All of the powers involved had learned from their experiences on the home front during World War I. Their success in mobilizing economic output was a major factor in supporting combat operations. Among morale-boosting activities that also benefited combat efforts, the home front engaged in a variety of scrap drives for materials crucial to the war effort such as metal, rubber, and rags. The sudden German invasion of neutral Belgium in May 1940 led in a matter of 18 days to the collapse of the Belgian army; King Leopold obtained an armistice that involved direct German military administration. The King refused the government's demand that he flee with them to Britain; he remained as a puppet ruler under German control. The Belgian bureaucracy remained in place and generally cooperated with the German rulers. Two pro-German movements, the Flemish National Union comprising Flemish (Dutch-speaking) separatists and the Walloon (French-speaking) Rexists led by Léon Degrelle (1906–94), supported the invaders and encouraged their young men to volunteer for the German army. Small but active resistance movements, largely Communist, provided intelligence to the Allies. During the Holocaust in Belgium, the Nazis hunted down the 70,000 Jews living in Belgium, most of them refugees, and killed 29,000 of them. The Germans expected to exploit Belgium's industrial resources to support their war machine. Their policies created severe shortages for the Belgian people, but shipped out far less than Germany had expected. They set up the "Armaments Inspection Board" in 1940 to relay munitions orders to factories; the Board came under the control of the German Minister of Armaments, Albert Speer in 1943, and had offices in industrial areas that were supposed to facilitate orders for materiél, and supervise production. However, factory production fell sharply after 1942. Although collaboration with the Nazis, especially among the Flemish, was evident in 1940, it soon faded in importance. Labor strikes and systematic sabotage slowed production, as did the emigration of workers to rural areas, Allied bombing, food shortages, and worker resentment of forced labor. China suffered the second highest number of casualties of the entire war. Civilians in the occupied territories had to endure many large-scale massacres, including that in Nanjing. In a few areas, Japanese forces also unleashed newly-developed biological weapons on Chinese civilians, leading to an estimated 200,000 dead. Tens of thousands died when Nationalist troops broke the levees of the Yangtze to stop the Japanese advance after the loss of the Chinese capital, Nanjing. Millions more Chinese died because of famine during the war. At the end of the war Japan was bombed with 2 atomic bombs and surrendered these bombs fell on Nagasaki and Hishiroma.Japan captured major coastal cities like Shanghai early in the war, cutting the rest of China off from its chief sources of finance and industry. Millions of Chinese moved to remote regions to avoid invasion. Cities like Kunming ballooned with new arrivals. Entire factories and universities were relocated to safe areas so society could still function. Japan replied with hundreds of air raids on the new capital of Chongqing. China was divided into three zones, with the Nationalists in the southwest and the Communists led by Mao Zedong (Mao) in control of much of the northwest. Coastal areas were occupied by the Japanese, and civilians were treated harshly; young men were drafted into a puppet Chinese army. After the stunningly quick victory in June 1940, France was knocked out of the war; part of it, with its capital in Vichy, became an informal ally of the Germans. A powerful Resistance movement sprang up, as the Germans fortified the coast against an Allied invasion and occupied the northern half of the country. The Germans captured 2,000,000 French soldiers, and kept them in prisoner of war camps inside Germany for the duration of the war, using them as hostages to guarantee French cooperation. The Vichy French government cooperated closely with the Germans, sending food, machinery and workers to Germany. Several hundred thousand Frenchmen and women were forced to work in German factories, or volunteered to do so, as the French economy itself deteriorated. Nevertheless, there was a strong Resistance movement, with fierce anti-resistance activities carried out by the Nazis and the French police. Most Jews were rounded up by the Vichy police and handed over to the Germans, who sent them to death camps. Women suffered shortages of all varieties of consumer goods and the absence of the men in POW camps. The rationing system was stringent and badly mismanaged, leading to pronounced malnourishment, black markets and hostility to state management of the food supply. The Germans seized about 20% of the French food production, which caused severe disruption to the household economy of the French people. French farm production fell by half because of the lack of fuel, fertilizer and workers; even so, the Germans seized half the meat and 20% of the produce. Supply problems quickly affected French stores, which lacked most items. The government responded by rationing, but German officials set the policies and hunger prevailed, especially affecting young people in urban areas. In shops, the queues lengthened. Some people—including German soldiers who could take advantage of arbitrary exchange rates that favored Germany—benefited from the black market, where food was sold without coupons at very high prices. Farmers diverted meat to the black market, so there was much less for the open market. Counterfeit food coupons were also in circulation. Direct buying from farmers in the countryside and barter against cigarettes became common. These activities were strictly forbidden, and carried the risk of confiscation and fines. Food shortages were most acute in the large cities. Vitamin deficiencies and malnutrition were prevalent. Advice about eating a healthier diet and home growing produce was distributed. Slogans like "Digging for Victory" and "Make Do and Mend" appeared on national posters and became a part of the war effort. The city environment made these efforts nearly negligible. In the more remote country villages, however, clandestine slaughtering, vegetable gardens and the availability of milk products permitted survival. The official ration provided starvation-level diets of 1,300 or fewer calories a day (5400 kJ), supplemented by home gardens and, especially, black market purchases. On September 1, 1939, Germany invaded Poland, conquering it in three weeks, as the Soviets invaded the eastern areas. During the German occupation, there were two distinct civilian uprisings in Warsaw, one in 1943, the other in 1944. The first took place in a zone less than two square miles (5 km2) in area, which the Germans had carved out of the city and called Ghetto Warschau. The Germans built high walls around the ghetto, and crowded 550,000 Polish Jews into it, many from the Polish provinces. At first, people were allowed to enter and leave the ghetto, but soon its border became an "iron curtain". Unless on official business, Jews could not leave, and non-Jews, including Germans, could not enter. Entry points were guarded by German soldiers. Because of extreme conditions and hunger, mortality in the ghetto was high. In 1942, the Germans moved 400,000 ghetto residents to Treblinka where they were gassed on arrival. By April 19, 1943, when the Ghetto Uprising commenced, the population of the ghetto had dwindled to 60,000 individuals. In the following three weeks, virtually all died as the Germans fought and systematically destroyed the buildings in the ghetto. During the invasion of the Soviet Union in the early months of the war, rapid German advances almost captured the cities of Moscow and Leningrad. The bulk of Soviet industry which could not be evacuated was either destroyed or lost due to German occupation. Agricultural production was interrupted, with grain crops left standing in the fields. This caused hunger reminiscent of the early 1930s. In one of the greatest feats of war logistics, factories were evacuated on an enormous scale, with 1,523 factories dismantled and shipped eastwards along four principal routes to the Caucasus, Central Asia, the Ural, and Siberia. In general, the tools, dies and production technology were moved, along with the blueprints and their management, engineering staffs and skilled labor. The whole of the Soviet Union become dedicated to the war effort. The people of the Soviet Union were probably better prepared than any other nation involved in World War II to endure the material hardships of the war – primarily because they were so used to shortages and economic crisis in the past, especially during wartime—World War I had brought similar restrictions on food. Conditions were nevertheless severe. World War II was especially devastating to citizens of the USSR because it was fought on Soviet territory and caused massive destruction. In Leningrad, under German siege, over a million people died of starvation and disease. Many factory workers were teenagers, women and old people. The government implemented rationing in 1941 and first applied it to bread, flour, cereal, pasta, butter, margarine, vegetable oil, meat, fish, sugar and confectionery all across the country. The rations remained largely stable in other places[clarification needed] during the war. Off-ration food was often so expensive that it could not add substantially to a citizen's food supply unless they were especially well-paid. Peasants received no rations and had to make do with any local resources they farmed themselves. Most rural peasants struggled and lived in unbearable poverty, but others sold their surplus food at a high price; a few became rouble millionaires, until a currency reform two years after the end of the war wiped out their wealth. Despite harsh conditions, the war led to a spike in Soviet nationalism and unity. Soviet propaganda toned down extreme Communist rhetoric of the past as the people now rallied to protect their Motherland against the evils of the German invaders. Ethnic minorities thought to be collaborators were forced into exile. Religion, which was previously shunned, became a part of a Communist Party propaganda campaign to mobilize religious people. Soviet society changed drastically during the war. There was a burst of marriages in June and July 1941 between people about to be separated by the war, and in the next few years the marriage rate dropped off steeply, with the birth rate following shortly thereafter to only about half of what it would have been in peacetime. For this reason mothers with several children during the war received substantial honors and money benefits if they had several children—mothers could earn around 1,300 rubles for having their fourth child and up to 5,000 rubles for their tenth. 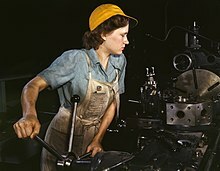 A US Government publicity photo of American machine tool worker in Texas. In the United States, farming and other production was increased. For example, citizens were encouraged to plant "victory gardens", personal farms that children sometimes worked on. Sociologist Alecea Standlee (2010) argues that during the war the traditional gender division of labor changed somewhat, as the "home" or domestic female sphere expanded to include the "home front"; meanwhile the public sphere—the male domain—was redefined as the international stage of military action. Japanese occupation of the Philippines was opposed by large-scale underground and guerrilla activity. The Philippine Army, as well as remnants of the U.S. Army Forces Far East continued to fight the Japanese in a guerrilla war. They formed an auxiliary unit of the United States Army. Their effectiveness was such that by the end of the war, Japan controlled only twelve of the forty-eight provinces. One element of resistance in the Central Luzon area was furnished by the Hukbalahap, which armed some 30,000 people and extended their control over much of Luzon. The Allies as well as the combined American and Filipino soldiers invaded in 1944–45; the battle for Manila was contested street by street with large numbers of civilians killed. As in most occupied countries, crime, looting, corruption, and black markets were endemic. With a view of building up the economic base of the Greater East Asia Co-Prosperity Sphere, the Japanese Army envisioned using the islands as a source of agricultural products needed by its industry. For example, Japan had a surplus of sugar from Taiwan, and a severe shortage of cotton, so they try to grow cotton in on sugar lands with disastrous results. They lacked the seeds, pesticides, and technical skills to grow cotton. Jobless farm workers flock to the cities, where there was minimal relief and few jobs. For the military story see Military history of the United Kingdom during World War II. Wartime food and cookery demonstrations, 1940. A British Restaurant in London, 1942. 2000 were opened to serve low-cost basic meals. Food, clothing, petrol, leather and other items were rationed. Perishable items such as fruit were not rationed. Access to luxuries was severely restricted, although there was also a significant black market. Families also grew "victory gardens", and small home vegetable gardens. Many goods were conserved to turn into weapons later, such as fat for nitroglycerin production. People in the countryside were less affected by rationing as they had greater access to locally sourced unrationed products than people in cities, and were more able to grow their own. The rationing system, which was originally based on a specific basket of goods for each consumer, was much improved by switching to a points system which allowed housewives to make choices based on their own priorities. Food rationing also permitted the upgrading of the quality of the food available, and housewives approved—except for the absence of white bread and the government's imposition of an unpalatable wheat meal "national loaf". Surveys of public opinion showed that most Britons were pleased that rationing brought equality and a guarantee of a decent meal at an affordable cost. From very early in the war, it was thought that the major industrial cities of Britain, especially London, would come under Luftwaffe air attack; this did happen in The Blitz. Some children were sent to Canada, the USA and Australia, and millions of children and some mothers were evacuated from London and other major cities to safer parts of the country when the war began, under government plans for the evacuation of civilians, but they often filtered back. When the Blitz bombing began on September 6, 1940, they evacuated again. The discovery of the poor health and hygiene of evacuees was a shock to many Britons, and helped prepare the way for the Beveridge Report. Children were evacuated if their parents agreed; but in some cases they had no choice. The children were only allowed to take a few things with them, including a gas mask, books, money, clothes, ration book and some small toys. A common theme called for an expansion of the welfare state as a reward to the people for their wartime sacrifices. This was set out in a famous report by William Beveridge. It recommended that the various forms of assistance that had grown up piecemeal since 1911 be rationalised. Unemployment benefits and sickness benefits were to be universal. There would be new benefits for maternity. The old-age pension system would be revised and expanded, and require that a person retired. A full-scale National Health Service would provide free medical care for everyone. All the major political parties endorsed the principles, and they were largely put into effect when peace returned. The themes of equality and sacrifice were dominant during the war, and in the memory of the war. Historian Jose Harris points out that the war was seen at the time and by a generation of writers as a period of outstanding national unity and social solidarity. There was little antiwar sentiment during or after the war. Furthermore, Britain turned more toward the collective welfare state during the war, expanding it in the late 1940s and reaching a broad consensus supporting it across party lines. By the 1970s and 1980s, however, historians were exploring the subtle elements of continuing diversity and conflict in society during the war period. For example, at first historians emphasized that strikes became illegal in July 1940, and no trade union called one during the war. Later historians pointed to the many localised unofficial strikes, especially in coal mining, shipbuilding, the metal trades and engineering, with as many as 3.7 million man days lost in 1944. Two boys in Montreal gather rubber for wartime salvage, 1942. 20% of Canada's population were neither of British nor French origin, and their status was of special concern. The main goal was to integrate the marginalized European ethnicities—in contrast to the First World War policy of internment camps for Ukrainians and Germans. In the case of Germany, Italy and especially Japan, the government watched minorities closely for signs of loyalty to their homelands. The fears proved groundless. In February 1942 21,000 Japanese Canadians were rounded up and sent to internment camps that closely resembled similar camps in the US, because the two governments had agreed in 1941 to coordinate their evacuation policies. Most had lived in British Columbia, but in 1945 they were released from detention and allowed to move anywhere in Canada except British Columbia, or they could go to Japan. Most went to the Toronto area. Shop stewards in the canteen of the Burrard Dry Dock in North Vancouver, British Columbia, Canada. Commencing in 1942, Burrard Dry Dock hired over 1000 women, all of whom were dismissed at the end of the war to make way for returning men. Canadian women responded to urgent appeals to make do, recycle and salvage in order to come up with needed supplies. They saved fats and grease; gathered recycled goods; handed out information on the best ways to get the most out of recycled goods; and organized many other events to decrease the amount of waste. Volunteer organizations led by women also prepared packages for the military overseas and for prisoners of war in Axis countries. With World War II came a dire need for employees in the workplace. Without women to step in, the economy would have collapsed. By autumn 1944 there were twice as many women working full-time in Canada's paid labour force as in 1939: between 1.0 and 1.2 million; and this did not include part-time workers or women working on farms." Women had to take on this intensive labour and still find time to make jam, clothes, and undertake other acts of volunteering to aid the men overseas. Australian women were encouraged to contribute to the war effort by joining one of the female branches of the armed forces or participating in the labour force. The Curtin Labor Government took over in October 1941, and energised the war effort, with rationing of scarce fuel, clothing and some food. When Japan entered the war in December 1941, the danger was at hand, and all women and children were evacuated from Darwin and northern Australia. The Commonwealth Government took control of all income taxation in 1942, which gave it extensive new powers and greatly reduced the states' financial autonomy. Manufacturing grew rapidly, with the assembly of high performance guns and aircraft a specialty. The number of women working in factories rose from 171,000 to 286,000. The arrival of tens of thousands of Americans was greeted with relief, as they could protect Australia where Britain could not. The US sent in $1.1 billion in Lend Lease, and Australia returned about the same total in services, food, rents and supplies to the Americans. New Zealand, with a population of 1.7 million, including 99,000 Maori, was highly mobilised during the war. The Labour party was in power and promoted unionisation and the welfare state. The armed forces peaked at 157,000 in September 1942; 135,000 served abroad, and 10,100 died. Agriculture expanded, sending record supplies of meat, butter and wool to Britain. When American forces arrived, they were fed as well. The nation spent £574 million on the war, of which 43% came from taxes, 41% from loans and 16% from American Lend Lease. It was an era of prosperity as the national income soared from £158 million in 1937 to £292 million in 1944. Rationing and price controls kept inflation to only 14% during 1939–45. The British recruited some 2.5 million Indian volunteers, who played major roles as soldiers in the Middle East, North Africa and Burma in the British Indian Army. India became the main base for British operations against Japan, and for American efforts to support China. The Japanese imprisoned the ruling British colonial elite and sought to win over the local merchant gentry by appointments to advisory councils and neighbourhood watch groups. The policy worked well for Japan and produced extensive collaboration from both the elite and the middle class, with far less terror than in other Chinese cities. Hong Kong was transformed into a Japanese colony, with Japanese businesses replacing the British. The Japanese Empire had severe logistical difficulties and by 1943 the food supply for Hong Kong was problematic. The overlords became more brutal and corrupt, and the Chinese gentry became disenchanted. With the surrender of Japan the transition back to British rule was smooth, for on the mainland the Nationalist and Communists forces were preparing for a civil war and ignored Hong Kong. In the long run the occupation strengthened the pre-war social and economic order among the Chinese business community by eliminating some conflicts of interests and reducing the prestige and power of the British. Germany had not fully mobilized in 1939, nor even in 1941. Not until 1943, under Albert Speer (the minister of armaments in the Reich), did Germany finally redirect its entire economy and manpower to war production. Instead of using all available Germans, it brought in millions of slave workers from conquered countries, treating them badly (and getting low productivity in return). Germany's economy was simply too small for a longer all-out war. Hitler's strategy was to change this by a series of surprise blitzkriegs. This failed with defeats in Russia in 1941 and 1942, and against the economic power of the allies. Although Germany had about double the population of Britain (80 million versus 46 million), it had to use far more labor to provide food and energy. Britain imported food and employed only a million people (5% of the labour force) on farms, while Germany used 11 million (27%). For Germany to build its twelve synthetic oil plants with a capacity of 3.3 million tons a year required 2.4 million tons of structural steel and 7.5 million man-days of labor. (Britain imported all its oil from Iraq, Persia and North America). To overcome this problem, Germany employed millions of forced laborers and POWs; by 1944, they had brought in more than five million civilian workers and nearly two million prisoners of war—a total of 7.13 million foreign workers. Teenage girls in agricultural work in the occupied territories, one of the possible duties assigned by the Bund Deutscher Mädel (League of Young German Women), the female version of the Hitler Youth, with compulsory membership for girls. The caption in Das Deutsche Mädel, in its May 1942 issue, states: "bringing all the enthusiasm and life force of their youth, our young daughters of the Work Service make their contribution in the German territories regained in the East". Rationing in Germany was introduced in 1939 immediately upon the outbreak of hostilities. Hitler was at first convinced that it would affect public support for the war if a strict rationing program was introduced. The Nazis were popular partly because Germany was relatively prosperous, and Hitler did not want to lose popularity or public support. Hitler felt that food and other shortages had been a major factor in destroying civilian morale during World War I, leading to defeatism and surrender. Despite the rationing, civilians had enough food and clothing; witness Howard K. Smith later wrote that "[f]or a people engaged in a life-and-death war ... the German people for two years of war ate amazingly well." The meat ration, for example, was 500 g per week per person. After the German invasion of the Soviet Union in June 1941, however, this changed to 400 g per week, then fell further. Estimating that the meat ration had dropped by up to 80% in five months of fighting in Russia, and citing many other sudden changes in living conditions, Smith wrote that by the time he left Germany in late 1941, "for the first time ... the German people are undernourished". The system gave extra rations for men involved in heavy industry, and extremely low starvation rations for Jews and Poles in the areas occupied by Germany, but not to the Poles inside Germany, many of whom had been brought in to perform heavy labor in German war industries. The rations were enough to live from, but clearly did not permit luxuries. Whipped cream was unknown from 1939 until 1948, as well as chocolates, cakes with rich creams etc. Meat could not be eaten every day. Other items were not rationed, but simply became unavailable as they had to be imported from overseas: coffee in particular, which throughout was replaced by substitutes made from roasted grains. Vegetables and local fruit were not rationed; imported citrus fruits and bananas were unavailable. In more rural areas, farmers continued to bring their products to the markets, as large cities depended on long distance delivery. Many people kept rabbits for their meat when it became scarce in shops, and it was often a child's job to care for them each day. By spring 1945, food distribution and the ration system were increasingly in collapse, due to insurmountable transportation disruption and the rapid advance of the Allied armies from west and east with consequent loss of food storage facilities. In Berlin, at the start of the Battle of Berlin, the authorities announced a special supplementary food ration on April 20, 1945. It consisted of a pound (450 g) of bacon or sausage, half a pound of rice, half a pound of peas or pulses, a pound of sugar, four ounces (110 g) of coffee substitute, one ounce of real coffee, and a tin of vegetables or fruit. They also announced that standard food ration allocations for the next fortnight could be claimed in advance. The extra allocation of rations were dubbed by Berliners Himmelfahrtsrationen, Ascension-day rations, "because with these rations we shall now ascend to heaven"
Germany had a very large and well organized nursing service, with three main organizations, one for Catholics, one for Protestants, and the DRK (Red Cross). In 1934 the Nazis set up their own nursing unit, the Brown nurses, which absorbed one of the smaller groups, bringing it up to 40,000 members. It set up kindergartens in competition with the other nursing organizations, hoping to seize control of the minds of the younger Germans. Civilian psychiatric nurses who were Nazi party members participated in the killing of invalids, although this was shrouded in euphemisms and denials. Chiran schoolgirls waving goodbye to Kamikaze pilots. I shall be a corpse washed up. It will not be a regret." In 1937, the Shinmin no michi (The Way of the Subjects) was given to all Japanese citizens in order to teach them how they should behave. Similarly, the Japanese war ministry issued the Senjinkun (Field Service Code) in 1941, which tried to educate the soldiers on how to behave during wartime. Specifically, the Senjinkun contained the famous ideal of no-surrender which inspired many Japanese servicemen to commit suicide than risk capture or surrender. Observation of civilian wartime diaries and letters suggest that the government was successful in garnering massive support for the war. Despite the rationing that causes food shortages, many Japanese were happy to oblige. Sakamoto Kane, Kōchi housewife wrote: "For fish, the community council gave us a distribution of only shrimp and swordfish; we can't get either pork or beef. I have the feeling that little by little there will be shortages but that in war, we must aim for frugality even in small ways and we must be careful about waste–for the sake of the country." Such sentiments were very common in Japan. *669 is the combined number of deserters and defectors in 1939. Agricultural production in the home islands held up well during the war until the bombing started. It fell from an index of 110 in 1942 to 84 in 1944 and only 65 in 1945. Worse, imports dried up. The Japanese food rationing system was effective throughout the war, and there were no serious incidences of malnutrition. A government survey in Tokyo showed that in 1944 families depended on the black market for 9% of their rice, 38% of their fish, and 69% of their vegetables. The Japanese domestic food supply depended upon imports, which were largely cut off by the American submarine and bombing campaigns. Likewise there was little deep sea fishing, so that the fish ration by 1941 was mostly squid harvested from coastal waters. The result was a growing food shortage, especially in the cities. There was some malnutrition but no reported starvation. Despite government rationing of food, some families were forced to spend more than their monthly income could offer on black market food purchases. They would rely on savings or exchange food for clothes or other possessions. ^ Bob Moore, "Jewish Self-Help and Rescue in the Netherlands during the Holocaust in Comparative Perspective", Tijdschrift voor Geschiedenis (2011) 124#4 pp 492–505. ^ José Gotovitch, La Rüstungs-Inspektion Belgien, Archives et Bibliothèques de Belgique (1969) 40#3 pp 436–448. ^ Peter Williams and David Wallace, Unit 731: Japan's Secret Biological Warfare in World War II (Free Press, 1989). ^ Sarah Fishman, We Will Wait: Wives of French Prisoners of War, 1940–1945 (1991). ^ Roland, Charles G (1992). "Scenes of Hunger and Starvation". Courage Under Siege : Disease, Starvation and Death in the Warsaw Ghetto. New York: Oxford University Press. pp. 99–104. ISBN 978-0-19-506285-4. ^ "Odot" (PDF). Jerusalem: Yad Vashem. ^ John Barber and Mark Harrison, The Soviet Home Front, 1941–1945: a social and economic history of the USSR in World War II (1991) p. 77. ^ Barber and Harrison, The Soviet Home Front, 1941–1945 pp 81, 85–86. ^ Barber and Harrison, The Soviet Home Front, 1941–1945 pp 91–93. ^ Barber and Harrison, The Soviet Home Front, 1941–1945 pp 86–87. ^ Richard Bidlack, "Survival Strategies in Leningrad during the First Year of the Soviet-German War," in The People's War: Responses to World WarII in the Soviet Union, eds. Robert W. Thurston and Bernd Bonwetsch (Urbana: University of Illinois Press, 2000), 88. ^ Bidlack, "Survival Strategies in Leningrad," p 89. ^ Bidlack, "Survival Strategies in Leningrad," pp 93–94. ^ Bidlack, "Survival Strategies in Leningrad," p 97. ^ Bidlack, "Survival Strategies in Leningrad," p 98. ^ "World War II: Civic Responsibility" (PDF). Smithsonian Institution. Retrieved 25 March 2014. ^ Satoshi Ara, "Food supply problem in Leyte, Philippines, during the Japanese Occupation (1942–44)," Journal of Southeast Asian Studies (2008) 39#1 pp 59–82. ^ Alfredo G. Parpan, "The Japanese and the Philippine Church, 1942–45," Philippine Studies (1989) 37#4 pp 451–466. ^ Victory Gosiengfiao, "The Japanese Occupation: 'The Cultural Campaign,'" Philippine Studies (1966) 14#2 pp 228–242. ^ Jose Harris, "War and social history: Britain and the home front during the Second World War," Contemporary European History (1992) 1#1 pp 17–35. ^ Until November 1939, the Neutrality Acts prohibited the export of arms from the United States to belligerents. ^ Ruth Roach Pierson, "They're Still Women After All," The Second World War and Canadian Womanhood (McClelland & Stewart, 1986) p 9. ^ Gavin Long, The Six Years War (1973) p. 474. ^ « Making Britain: Second World War (1939–1945) », The Open University. ^ Snow, Philip (2004). The Fall Of Hong Kong: Britain, China and the Japanese Occupation. Yale U.P. p. 81. ISBN 978-0300103731. ^ Wei-Bin Zhang (2006). Hong Kong: The Pearl Made of British Mastery And Chinese Docile-Diligence. Nova Publishers. p. 109. ISBN 9781594546006. ^ Adam Tooze, Wages of Destruction: The Making and Breaking of the Nazi Economy (2006) pp. 429seq. ^ Smith, Howard K. (1942). Last Train from Berlin. Knopf. pp. 115–116, 120–131. ^ Read, Fisher, Anthony, David (1992). The Fall Of Berlin (Fifth ed.). London: Pimlico. p. 346. ISBN 978-0-7126-5797-6. ^ Ryan, Cornelius (2015). The Last Battle (2015 ed.). London: Hodder & Stouton. ISBN 978-1-473-62007-0. ^ Yamashita, Samuel Hideo. Daily life in wartime Japan, 1940-1945. Lawrence, Kansas. p. 11. ISBN 9780700621903. OCLC 919202357. ^ Yamashita Samuel, Hideo. Daily life in wartime japan, 1940 - 1945. p. 11. ISBN 9780700624621. OCLC 1023381472. ^ Tu Wei-ming, ed. (1997). Confucian traditions in East Asian modernity : moral education and economic culture in Japan and the four mini-dragons. Harvard University Press. pp. 147–153. ISBN 0674160878. OCLC 469805550. ^ Yamashita, Samuel Hideo. Daily life in wartime Japan, 1940-1945. Lawrence, Kansas. ISBN 9780700621903. OCLC 919202357. ^ Kodera, Yukio (2005). Senji no nichijō : aru saibankan fujin no nikki. Tokyo: Hakubunkan. p. 119. ^ Yamashita Samuel, Hideo. Daily life in wartime japan, 1940 - 1945. p. 172. ISBN 9780700624621. OCLC 1023381472. ^ "Ryukyu Shimpo, Ota Masahide, Mark Ealey and Alastair McLauchlan, Descent Into Hell: The Battle of Okinawa | The Asia-Pacific Journal: Japan Focus". apjjf.org. Retrieved 2019-03-18. ^ Inoue. Kindai. p. 109. ^ Dear, Ian; Foot, M. R. D. (1995). The Oxford companion to the Second World War. Oxford University Press. p. 297. ISBN 0192141686. OCLC 46240444. ^ Nakamura, Takafusa, et al. eds. Economic History of Japan 1914–1955: A Dual Structure (vol 3 2003), 326 – 32. ^ ""Food Situation," November 2, 1945, Asahi, In Press Translations Japan, Social series, No. 1, Item 3, Pages 2-3, ATIS, G2, SCAP, November 5, 1945". Dartmouth Digital Library. 2 Nov 1945. Retrieved 26 Oct 2015. ^ One third of the Soviet housing stock was damaged or destroyed according to Jane R. Zavisca (2012). Housing the New Russia. Cornell UP. p. 29. ISBN 978-0801464775. ^ Jeffry M. Diefendorf Professor and Chair of the History Department University of New Hampshire (1993). In the Wake of War : The Reconstruction of German Cities after World War II: The Reconstruction of German Cities after World War II. Oxford UP. pp. 126–27. ISBN 9780195361094. Davies, Norman (2004). Rising '44: The Battle for Warsaw. Viking. ISBN 0-670-03284-0. Harris, Jose. "War and social history: Britain and the home front during the Second World War," Contemporary European History (1992) 1#1 pp 17–35. Yust, Walter, ed. 10 Eventful Years: 1937–1946 4 vol. Encyclopædia Britannica, 1947. Parsons, Gwen. "The New Zealand Home Front during World War One and World War Two." History Compass 11.6 (2013): 419-428. Harris, Carol (2000). Women at War 1939–1945: The Home Front. ISBN 0-7509-2536-1. Marwick, Arthur (1976). The Home Front: The British and the Second World War; heavily illustrated . Stephenson, Jill. Hitler's Home Front: Wurttemberg under the Nazis (2006). Morgan, D. Italian Fascism, 1919–1945 (1995).